The Beatles and the Mersey Beat: In the latest Blogging the Beatles, how The Beatles popularized the sound of Liverpool. Brow Beat is following the Beatles in “real time,” 50 years later, from their first chart-topper to their final rooftop concert. 50 years ago this month, The Beatles played their first “Mersey Beat Showcase,” spreading the sound of Liverpool. 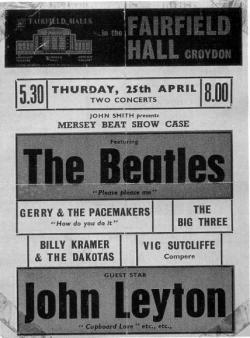 Poster for the “Mersey Beat Showcase” in Croydon, in April 1963. Promotional image via the Beatles Bible. Brian Epstein had an idea. The Beatles had just lodged their first No. 1 hit on the charts, and Gerry and the Pacemakers, another band off his burgeoning roster, had a sure hit on the way—“How Do You Do It?” The Beatles refused to release that song themselves, considering it too old-fashioned, but the Pacemakers took it to No. 1. Looking over the list of promising names in his lineup, Epstein thought: Why not get them all together? In their own attempts to define the sound, Mersey bands pointed to the “chunk chunk on the drums” and a gut-rattling “thump thump on the bass.” (You can watch the artists offer these descriptions about 3 minutes into the video below.) They also had lineups just like the Beatles’, which soon became the standard template for every rock band—four or five guys, among them a lead guitarist, a rhythm guitarist, a bassist, and a drummer. Their names, too, often followed a similar format: Other Mersey beat groups included The Undertakers, The Swinging Blue Jeans, and The Mojos. Many people ask what are Beatles? Why Beatles? Ugh, Beatles, how did the name arrive? So we will tell you. It came in a vision—a man appeared on a flaming pie and said unto them: ‘From this day on you are Beatles.’ ‘Thank you, Mister Man, they said, thanking him. 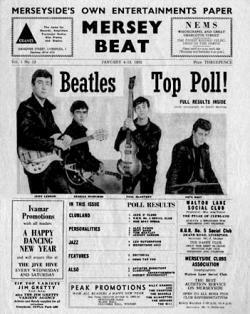 The Mersey Beat proved crucial in cementing the Liverpool scene. In fact, it’s how Brian Epstein first learned about the Beatles. After he got the group their recording contract with EMI’s Parlophone label, one of the first things he did was send a telegram to Bill Harry with the news. But even before they signed with Parlophone, the Beatles were at the forefront of the Liverpool groups. 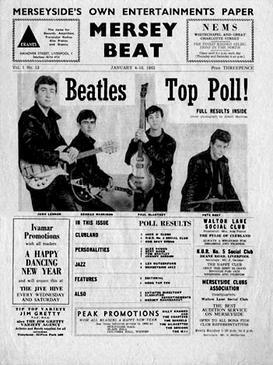 When Mersey Beat ran its first poll to determine the most popular Merseyside band, Gerry & the Pacemakers and others placed highly, but the Beatles came out on top.